Focusrite's Control 2802 is a super-flexible analogue console and an Ethernet-based DAW control surface in one. Precision analogue audio architecture delivers a superb, big studio sound, while Control 2802 demonstrates extraordinarily versatile routing capability, with cues and auxes available to provide up to 32 mix inputs and a DAW-integrated two-part in-line-style channel. Ethernet-connected HUI control layer allows DAW operation right from the console. There’s no other small-format console quite like Control 2802: nothing sounds like it, and nothing offers this level of design sophistication, flexibility and control. With an array of superb-quality analogue features packed into its compact frame, Focusrite Control 2802 includes capabilities you would expect to find only on large-format consoles. 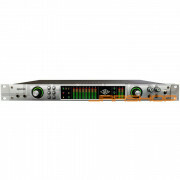 At the front end, eight Class-A microphone preamps deliver clear, transparent performance. 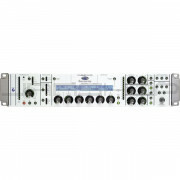 Then at its heart is a powerful summing mixer handling up to 32 simultaneous inputs with ultra-low distortion, excellent dynamic range and a frequency response wider than the human ear. There’s a punchy master bus compressor featuring parallel compression for versatile control of dynamics for your stereo mix – or any other pair of channels. High-end analogue design characterises the 2802 – implemented with similarly uncompromised components and build quality throughout. You can control every major digital audio workstation with the Control 2802. Dual Layer Control Technology lets you flip from analogue fader layer to DAW layer in an instant, accessing fully integrated control of DAW faders, auxes, plug-ins, automation, project navigation – and more. With Ethernet-based control, your favourite music software is always at your fingertips. 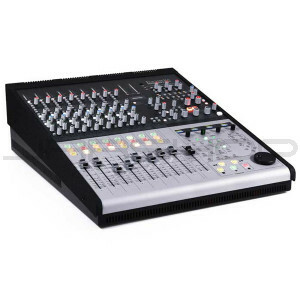 The Control 2802’s motorised 100mm analogue and DAW control faders can both be fully automated. Easily adjust DAW channel auxes, inserts and groups within Pro Tools, Logic, Cubase and Nuendo via a HUI interface. Four multi-function encoders give you precise control while OLED screens provide detailed information on mix elements. Combined with dedicated transport controls, that means more time getting your sound just right, and less time staring at a screen. In the box you will find the Focusrite Midnight plug-in suite. Modelled on original Focusrite hardware designs, these plug-ins allow you to add compression and EQ, helping you take your mix to the next level. Of course the plug-ins can be controlled and assigned to channels from the comfort and convenience of the Control 2802, so there's no need to grab the mouse! That’s it in a nutshell: the Focusrite Control 2802 brings together a compact analogue mixing console with large-format console quality, and a superb, automated, multi-DAW control surface – plus the ability to flip between the two in an instant. The Control 2802 from Focusrite; in control of your sound.